All-in-one support for Phoenix, Mamba, and Phoenix HV brushless controllers, with Barracuda and Thunderbird additions coming soon! Now with saved settings files! New "check for updates" feature! Expanded programming and parameters for Mamba-25 controllers also coming soon! The easiest programming tool just got easier to use and configure your Castle Creations controllers! Castle Creations introduces a bold new step in speed control technology. 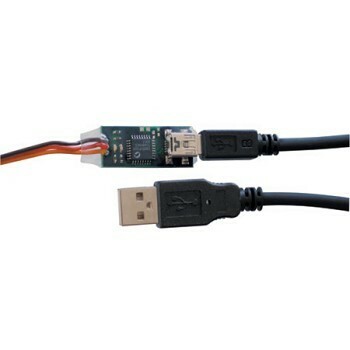 The PHX-Link allows users to connect their Phoenix brushless controller directly to the USB port of their PC and set up programmable features with ease. The host software must be downloaded from Castle Creations' website: www.castlerc.com. If you know about Castle Creations Speed Controllers, you already know about the Castle Link (formerly know as the PHX-Link). 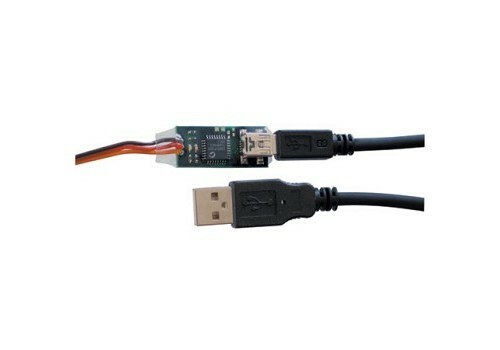 It is the device that allows you to connect your Castle Creations Brushless Speed Controller directly to your Windows computer through a USB port, right . . . ? Well, yes, but that is only a small part of the Castle Link story. Many Speed Controller companies offer a way to program their products but only the Castle Link program allows you to update the entire software within the controller. Lets look at why this is so important. What is a speed controller? The hardware itself is just a bunch of small chunks of silicon, and a few electrical support components fastened to a high copper content circuit board. By itself it can do nothing. The real magic in a brushless speed controller is in its software. It is the software that allows the speed controller to vary the speed of your brushless motor to match the motion of your transmitters throttle stick. It is the software that allows the speed controller to interpret the commands from your transmitter, to sense the motors motion and to send commutation pulses to the motor at precisely the right time which make the motor spin at the speed you select in the direction you want. It is the software that sets timing advance dynamically several thousand times per second, to get the most power and efficiency from the motor at any and all RPMs. It is the software that brakes the prop in several different ways, protects against over current situations, protects your battery investment by check battery voltage and cutting motor power to prevent over discharging. It is the software that allows you to hook up to the Castle Link, and set all of the other functions you can change on the controller with the Link. In short, everything the ESC does, is done by software. What this all means is, that with a Castle Link you avoid your current controllers becoming obsolete as rapid changes continue to occur in the technology of electric RC Your original investment in your Castle Creations speed controller is protected against changes in battery technology, motor technology, and any other unforeseen change in the world of electric powered RC. We all know that at this point in the evolution of our favorite hobby/sport that change and rapid advancements are inevitable, and occurring at an ever increasing pace. While the Castle Creations business model is in direct opposition to the norm, it was designed as a simple commitment of ongoing value to our customers. It would be great if this philosophy spread to the rest of the RC industry. Imagine if you could update and add new features to you precious computer radio. What if you could update all of your RC components so they would work with each other as an integrated whole, and then be able to provide you with data about what is going on with your system? And then have all of the above displayed in real time! The future of RC is in the software used to run the devices that make our passion possible. Once the barriers presented by proprietary software, and the idea of planned obsolescence come down, the world radio controlled flight with make a quantum leap forward in performance, reliability and usability. As consumers, we can make this happen by supporting those companies who put their customers interest FIRST and are willing to work with others in the industry to break down communications barriers between equipment.